Over the last decade, Denver has truly transformed from a contained blue-collar environment to a thriving cultural epicenter, with a celebrated music scene, renowned restaurants and bars (including some of the best breweries in America), and a great mixture of outdoor recreation and historic museums and art galleries. The Denver Botanic Gardens are known as a tiny paradise in the middle of the downtown area and hold some of the most beautiful exhibits and natural collections in the country. The gardens are truly awe-inspiring in the spring and summer months, but don’t count on them too much for the rest of the year, when the snows hit the Rockies. During the holiday season, the gardens hold the Blossoms of Lights festival and decorate the grounds in twinkling lights and illuminations. Denver Museum of Nature and Science promises ” mind-bending exhibits, visionary architecture, and true family fun all wrapped up into one outstanding day out.” The museum has a few remarkable permanent exhibits, like the Space Odyssey, Prehistoric Journey and the Wildlife exhibit, as well as traveling exhibits that have been known delve into such variegated topics as Chocolate and Sherlock Holmes. The IMAX theater plays an assortment of different documentaries that each provoke awe and amazement, while the collections are as educative as they are enthralling. There are thousands of restaurant to try in Denver, but Root Down transcends with the most delicious food with unique twists and a lively, unforgettable atmosphere. This restaurant aims to bring whole new tastes to tapas, with plenty of small sharing plates as well as delectable entrees like the Aspen Ridge short ribs, Colorado lamb sliders, and country fried tofu. Root Down strives to create the most flavorsome meals by using fresh and organic ingredients that are locally grown, which means it’s a fine place to come for a taste of the Rocky Mountain region. Denver Beer Co. is a staple of the Denver community. Located in central downtown, Denver Beer Co. is a favorite for a happy hour, fun relaxing Saturday afternoons, or any rabble-rousing game day. One of the main draws for this brewery is the outside sitting area: they have several long tables that are perfect for hanging out with friends on a beautiful sunny afternoon. Denver Beer Co. mixes up their brews, ranging from pumpkin ale to blood orange IPA to graham cracker porter to even a coffee IPA – there’s something for everyone! One of the famous streets of Denver, South Broadway has one of the most eclectic gatherings of shops, bars, and restaurants in the country. It is collection of sixteen blocks that has almost 100 antique shops along the way and has even earned the nickname of Antique Row. It’s also got used bookstores, art galleries, music venues, and oodles of other curious craft emporiums. There is a nice array of drinking dives, eateries and cafes in the area too. Union Station was first constructed in 1881 and was a famous landmark in Denver for nearly 130 years. In 2014, the city finished a reconstruction of the station and added an assortment of restaurants, stores and even a hotel. The station has 10 restaurants, ranging from the Acme Burger & Brat Corporation to PigTrain Coffee to some of the best breakfasts around at Snooze and AM Eatery. Union Station has now become a go-to spot for shopping and having an elegant night on the town – not to be missed! One of the largest parks in Denver, City Park is a wonderful spot to enjoy the great outdoors. Within the 330 acre area, there is the Denver Zoo as well as the Museum of Science and Nature. There is plenty to do here too, from riding bikes to playing sports to going for runs. City Park is made for the active individual and there is no denying that citizens of Denver love to spend time outdoors, so expect this one to always have a buzzing local vibe about it. 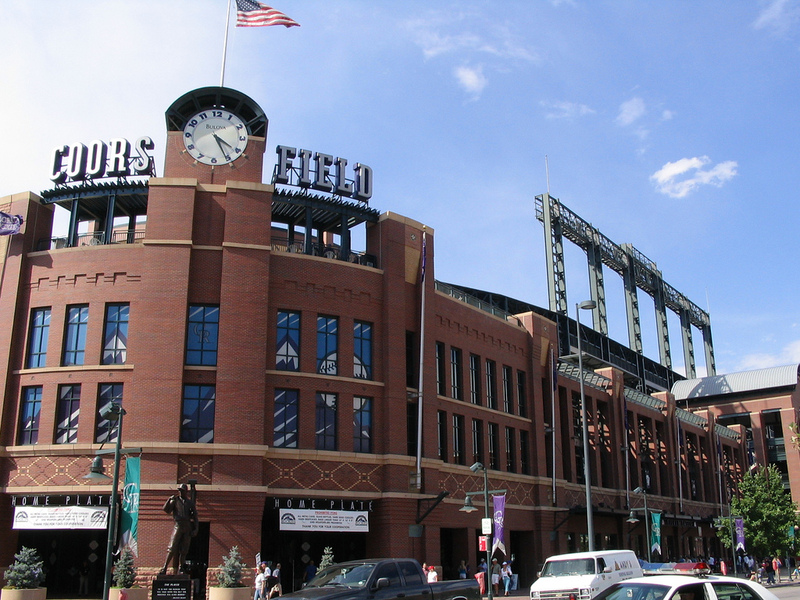 Coors Field is a major part of the Denver downtown and there is nothing more fun than eating a hot dog and watching a good ole’ home game in its vicinity. Denver is one of the only cities with all five sports teams – from the Broncos in football to Avalanche from hockey to Rapids for soccer and Nuggets for basketball and especially the Rockies for baseball. Sloan’s Lake Park is another great park in the Denver downtown area. It is named after the large picturesque lake at its heart and the trails that surround it. There are few things better than spending a Sunday afternoon picnic here, or going for a scenic bike ride around the greenery of the gardens. This is favorite for dog-owners too, so you can rest assured there will be plenty of pups running around whatever the time of year. Since 1990 the Colorado Convention Center has been the go-to place for major events and event organisers looking to make their mark on the Mile High City. Right throughout the year major dates in Colorado’s entertainment and business calendar take place here, with everything from commercial conventions to Christmas pantomimes to summer time music fests taking place within the walls. The convention center can be found smack bang in the middle of the Denver downtown area, surrounded by top-quality hotels and eateries.